HyperX®, the gaming division of Kingston Technology® Company, Inc., today, launched itsfirst SSD in India with RGB – HyperX®FURY RGB SSD. This performance rich SSD is designed for a better gaming experience while brightening and enhancing the rigs with more color and LED lighting. It utilizes 3D NAND technology for better power efficiency and durability, delivering high read and write speeds, 10 times faster than a 7200RPM hard drive1.The HyperX FURY RGB SSD is available in HyperX network of retail and e-tail stores at MRPs of INR9,349/-, INR 15,330/- andINR 27,230/- for240GB, 480GB and 960GB respectively. HyperX FURY RGB SSD is also available as an upgrade bundle kit at MRPs of INR 11,315/-, INR 17,300/- and INR 29,200/-for 240GB, 480GB and 960GB capacities respectively.It is backed by a limited 3-year warranty7 with free technical support. · Enhanced Visual Experience: The FURY RGB SSD offers an enhanced visual experience for gaming, overclocking PCs, and DIY system builds with up to 550MB/s read and 480MB/s write speeds1 and a visually stunning lightbar that offers dynamic, customizable RGB lighting effects2. Compatible with RGB motherboards that support RGB lighting and multiple RGB devices3, FURY RGB SSD can also be daisy chained to sync RGB effects across system internals. FURY RGB SSD is available in 240GB, 480GB, and 960GB capacities4. It is sold as a standalone RGB SSD or with an upgrade bundle kit that includes a USB 3.0 enclosure, 3.5” bracket and mounting screws, RGB cable, SATA data cable, USB 3.1 Type A to mini-USB Cable and Hard Drive Cloning Software. HyperX takes the tagline We’re All Gamers to heart. Whether you are an amateur or professional player, our goal is to meet or exceed customer expectations with every gaming memory product, headset, keyboard, mouse or mousepad we design. 1 Based on “out-of-box performance” using a SATA Rev 3.0 / PCIe 3.0 motherboard. Speed may vary due to host hardware, software, and usage. IOMETER Random 4K Read/Write is based on 8GB partition. 2 Lighting customizable with motherboard RGB control software. 3 FURY RGB does not support “dynamic RGB lighting” or header. 4 Some of the listed capacity on a Flash storage device is used for formatting and other functions and thus is not available for data storage. As such, the actual available capacity for data storage is less than what is listed on the products. For more information, go to Kingston’s Flash Memory Guide at Kingston. com/flashguide. 5 When used with a gaming console, formatting may be required. 6 Based on internal testing data, loading times may vary for each individual game. 7 Limited warranty based on 3 years or “SSD Life Remaining” which can be found using the Kingston SSD Manager (Kingston.com/SSDManager). A new, unused product will show a wear indicator value of one hundred (100), whereas a product that has reached its endurance limit of program erase cycles will show a wear indicator value of one (1). See Kingston.com/wa for details. 8 Total Bytes Written (TBW) is derived from the JEDEC Client Workload (JESD219A). 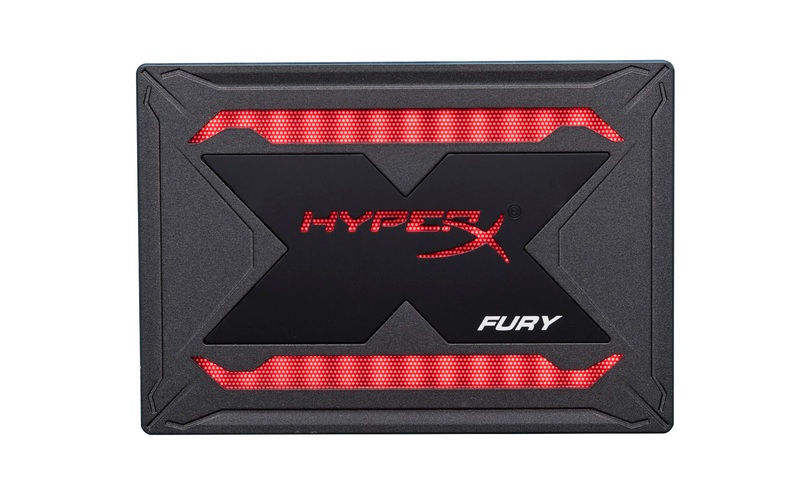 HyperX was born from Kingston Technology, the world’s largest independent memory manufacturer, with the goal of providing gamers, PC builders, and power users with high-performance components. For 15 years, the HyperX mission has been to develop gaming products for gamers – high-speed memory, solid state drives, headsets, keyboards, mice, USB flash drives, and mouse pads – to the gaming community and beyond. The award-winning HyperX brand has carved its name atop the leaderboard by consistently delivering products that deliver superior comfort, aesthetics, performance, and reliability. HyperX gear is the choice of pro gamers, tech enthusiasts, and overclockers worldwide because it meets the most stringent product specifications and is built with best-in-class components. HyperX has shipped over 5 million headsets worldwide.